Fishermen in coastal areas have also been affected due to Gaja cyclone. 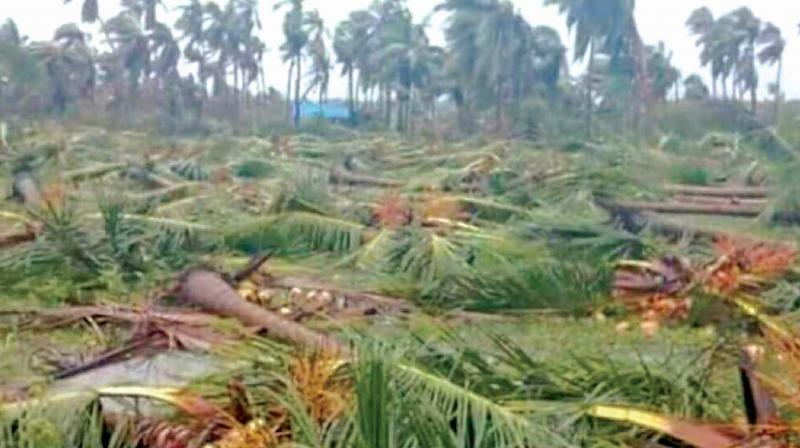 It was an unprecedented devastation and 40 lakh coconut trees were uprooted in the cyclone that hit the areas on November 15 and 16. THANJAVUR: With Pattukottai, Peravurani and Mannargudi Assembly constituencies, affected by Gaja cyclone last year, coming under Thanjavur Lok Sabha constituency, devastation caused by Gaja and its aftermath has become a poll issue in the constituency. Many coconut farmers complain that they have not received any relief. While ruling party members are harping on the relief reached to people, amount put in the bank accounts of coconut farmers by government, opposition parties highlight that relief had not reached fully to all. S.S.Palanimanickam, former union minister who is the DMK candidate for Thanjavur Lok Sabha constituency, who frequently visited Gaja affected Pattukottai and Peravurani at the time of cyclone, assures people that he would take long-term measures to sustain the growth of planted new seedlings besides arranging for new seedlings in places where they have not been planted. On the other hand, N.R.Nadarajan, TMC (Moopanar) candidate for the constituency, who belongs to Pattukottai says, his family, his brother N.R. Rangarajan, fromer MLA of Pattukottai and others in his family arranged relief measures to people at the time of Gaja cyclone. "We, ourselves being coconut farmers were affected in the cyclone. Yet, we arranged relief camps for people affected in Gaja cyclone and constructed houses for them," he said. One independent candidate Ms. Samanta, a PG doing Ph.D has entered into the fray highlighting Gaja issue and assuring rehabilitation for farmers. It was an unprecedented devastation and 40 lakh coconut trees were uprooted in the cyclone that hit the areas on November 15 and 16. "Most of us have lost our livelihood. Slowly we are trying to come out of the loss and damage. It will take another ten or 15 years to recover fully. Parties which assure livelihood and rehabilitation measures will be preferred by the farmers," said Devasenan, a farmer from Pattukottai. Fishermen in coastal areas have also been affected due to Gaja cyclone. Large number of boats and fishing nets were damaged. Though government announced relief for repairing old boats damaged in cyclone and purchase of new boats, fishermen of Adhirampattinam and Mallipattinam complain that relief had not reached all fishermen. Tajudeen, state secretary of 'Tamil Nadu Meenavar Peravai' said though four-and-a half months had gone by after Gaja struck Pattukottai and Peravurani areas, relief had reached only for a few damaged boats. Many fishermen who lost their boats have not received the relief, "In Sethubavachathiram, 188 boats were damaged, but relief given only to 58 boats," Tajudeen said, adding, prawn exports have been hit consequently. Yet another environment issue is approval given by central government for proposed hydrocarbon projects. People say that this issue affecting entire Cauvery delta, if ignored by the political parties, will be at their own peril.